I’m looking at a piece of olive wood. It’s on the table out here on the terrace and may be put on the fire tonight. The sun is warm here by day, but just after 5pm it slips behind the hill on the far side of the barranca. Suddenly it’s cool, the heater has been switched off, the power cut. When evening temperatures dip to single figures and the cool tiled floors inside the house lose their daytime charm, we light a fire. Most houses here have wood-burning stoves for the winter. The fuel of choice is olive; it’s obvious when you drive into the back country or across the wide plain of Tabernas, just west of here. Mile after mile of olives stand in straight rows like an army of soldiers wearing jungle camouflage. Something quakes deep inside me each time a log is placed on the fire. It feels sacrilegious. I dig back to try and understand why. In the summer of 1961, my father was posted to Israel for a brief stint. We spent 3 months in Jaffa, a little town just along the coast from Tel-Aviv. Olive trees were everywhere. They were like nature’s lingua franca, the vernacular of Israel’s landscape. 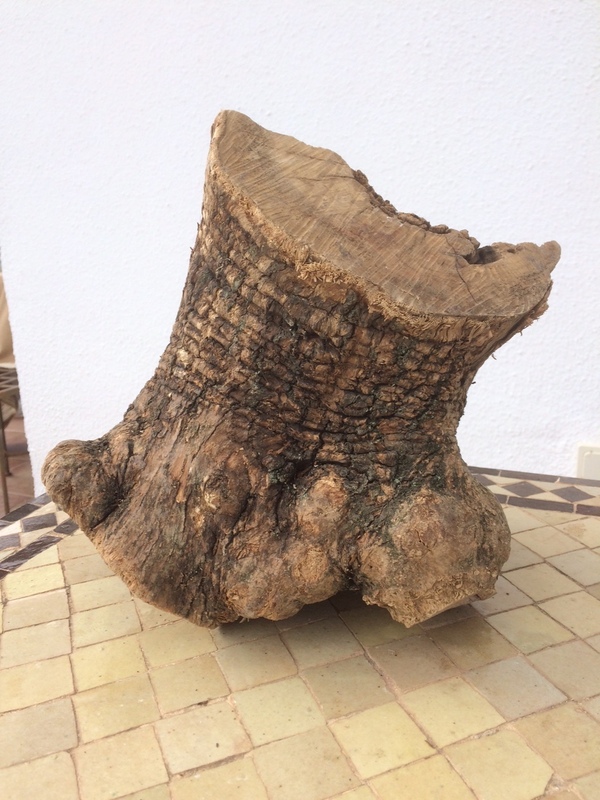 I was fascinated by their strange shapes, the way their trunks snaked and twisted, how they sometimes had great holes in the centre where you could hide. It was as if they had taken a detour years ago, setting off in a new direction to avoid some obstacle, responding to the weather or the encroachment of a neighbouring tree. We had an old car and, when we could, we travelled around the country, visiting some of the sites: Tiberias, Galilee, Gethsemane. Olives felt sacred and still do, even now in my long-lapsed state. The piece of wood in front of me was recently alive. For how many years, I wonder, did it weave its trunk and stretch its branches wide to catch the sun and ripen its load? You can count the years by the rings across the trunk, I’m told. But olive trees, with their ducking and diving in different directions, make that almost impossible. The inner contours ramble and digress like someone unable to finish a sentence. This piece looks like the severed foot of a very old elephant. Knobbly lumps swell at the base like nails; the bark is scored horizontally like wrinkled skin; at the side there’s a little depression where an insect may have bored in making a scar in the trunk, for all the world like an old wound on leathery hide. New olives are planted here season after season. How many years does it take for a tree to mature, to bear fruit copiously? How many years before it’s wearied with age? I’m guessing that these pieces, chopped up and stuffed into sacks for sale as firewood, are from trees that have been retired from active duty, supplanted by new ones standing in their own new rows. The cycle makes sense; the old making way for the new, offering themselves up for cremation so that their final act is a generous one. It still feels bad. I can’t throw off the feeling that we’re stoking our fires with something precious and irreplaceable. The sack cost less than €5 and I try to calculate the years of nature invested for that tiny return. A hundred? Maybe more, each log representing so many seasons of toil. The little tree that bends and twists and gives and gives right up to the end.